The Asian Human Rights Commission (AHRC) has received information from the Advocacy Forum that Ganga Maya Adhikari from Fujel, Gorkha district has started another hunger strike demanding the implementation of the Supreme Court’s order and impartial investigation and prosecution into the murder case of her son Krishna Prasad Adhikari. Krishna Prasad’s father perished in the pursuit of justice, and his mother now is on her deathbed. She must be saved, and given justice. Ganga Maya Adhikari from Fujel, Gorkha district began for the third time, a fast-on-to-death hunger strike on 29 May 2018. After 30 days of her hunger strike, her health condition is severely deteriorating. At present she has been kept in the ICU of Bir Hospital, Kathmandu. Ganga Maya has a simple demand: the arrest of Chhabilal Poudel, the main accused of the murder of her son, Krishna Adhikari, in accordance with the Supreme Court order of 21 December 2015, and investigation into the case. It is tragic that the government is not serious or humane enough to listen to her pleas for justice and act immediately to save her life. The legal proceedings, punishment to the culprit and reparation to the victim’s family members could be done in the later phase, but the immediate arrest of Poudel should be done to save Ganga Maya’s life. Ganga Maya along with her husband Nanda Prasad Adhikari, had started her first fast-on-to-death strike in January 2013. The hunger strike ended in 47 days, after the government assured them of justice in their son’s murder case. However, as the accused was released on bail immediately after the arrest, the Adhikari couple resumed their strike, which finally ended Nanda’s life on his 333rd day of fast-unto-death in September 2014. His body is kept in Tribhuwan University Teaching Hospital (TUTH) still waiting for cremation. Even after losing her husband, Ganga Maya had continued her hunger strike for a total of 360 days, until the government signed a five-point deal with her in October 2015. However, the lies of the government continued as no accused were arrested, and nor did the murder trial progress. Krishna Prasad Adhikari, an 18-year-old youth from Fujel VDC-7, Gorkha district was brutally killed on 6 June 2004 by the Maoists cadres in Chitwan district. The family’s efforts to seek justice have been futile due to state inaction, forcing them to be displaced from the village. They ultimately decided to take extreme measures. Ganga Maya is in the custody of the government. The state is under obligation to conduct prompt, fair and effective investigation into the murder case of Krishna Adhikari under both national and international laws. If Ganga dies in the custody of the state, the government will be individually liable. Likewise, the political parties must also take responsibility, as they have colluded to protect perpetrators of violations and promote impunity in the country. No political party in Nepal has taken up this case seriously. Furthermore, the Government has been defying court orders seriously undermining the rule of law. Ganga Maya was hospitalized because of her health condition but decided to fast onto death on May 29, Republican Day, when she saw Balkrishna Dhungel being released from presidential pardon. ‘I have no strength to witness this level of state protection to murderers and I want to die as I do not see any hope of getting justice for my son,’ she told the journalists organizing a press conference in the cabin of the Bir Hospital. I am writing to voice my deep concern regarding Ganga Maya Adhikari from Fujel, Gorkha district who began for the third time, a fast-on-to-death hunger strike on 29 May 2018. After 30 days of her hunger strike, her health condition is severely deteriorating. 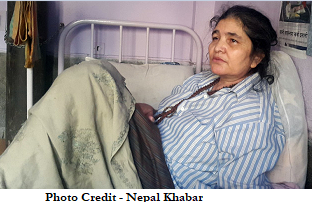 At present she has been kept in the ICU of Bir Hospital, Kathmandu.